Assessing risk associated with investing money is an important step before deciding how to go forward financially. The only way to avoid any risks entirely is to not invest at all, but those consequences will net you literally nothing. If you want to get ahead financially outside of work, you’ll need to make informed decisions each step of the way. Is investing work the risk? Absolutely. Here’s How to Get Past Your Fears. Before moving forward with an investment plan, assess where you’re at financially. Take a look at these factors that will influence how much time and money you can allocate to wealth building in the immediate future. Debt load. If you’re paying high rates of interest on credit cards or have loan payments that pinch your budget, it’s not likely you’ll find any investment that is worth the risk until you’ve paid down the debt. Few investments pay back at the same rate that credit card companies charge. Lowering high interest debt is your first step to saving money that will help increase your wealth. Cash flow situation. You’ll need a steady source of income to set aside some for investing on a routine basis. If you have ups and downs in your income stream or periodic balloon payments, some investment vehicles will work better than others. Before committing to a program that requires scheduled contributions, be sure you’ll be able to maintain the basics. Schedule. Some investments take more time than others to monitor and manage, although it’s possible to use managers who will tend to nearly every aspect of investments. If you have enough time or want to manage your investments directly, choose accordingly. Knowledge base. It’s so much easier to put your money into areas that you understand rather than selecting fields in which you have no experience, interest, or familiarity. Cash investments. T-bills, savings bonds, CDs, savings accounts, and some money market funds are insured by the FDIC and safe investments. Their drawback is that they’re return on investment is low. Low risk often equates to low reward in the investment world. Stock market. There is much more money to be made in the stock markets than in cash investments, but there are no guarantees or security when putting your money into a company. Between the years 1928 and 2017, S & P returned 10 percent annually. However, there have been periods where losses have been as substantial as gains. Real estate. Historically real estate has been one of the most stable investments with a return on the investment often better than the stock market. Tax advantages are another benefit of property ownership, whether it’s for your home or a rental, that you can’t get with most other investment types. The tax benefits, combined with the appreciation and cash flow from rental properties, attract investors to real estate. Crowdfunding investments. Investment opportunities are springing up online that allow individuals to make small contributions to crowdfund start up companies. Although these groups have a limited track record, overall they’ve performed well. 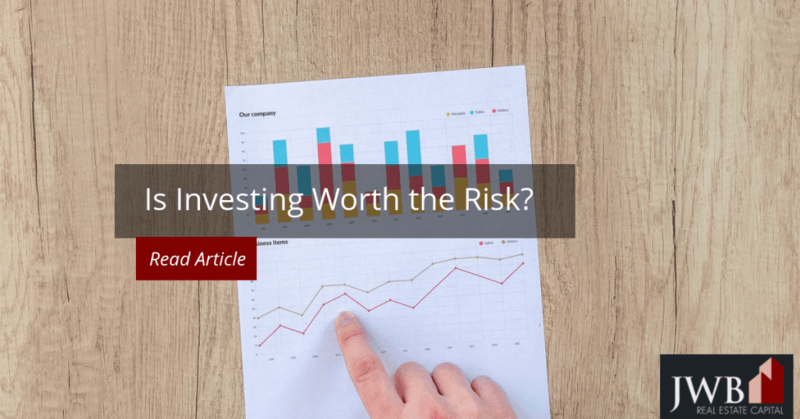 Although there are risks associated with putting your money into investments, the greater risk is not moving forward financially. As you move forward, spend time learning about the most suitable risk levels for you to take and which avenues hold the most promise for your future. JWB has over 10 years experience managing turnkey rental property investments. 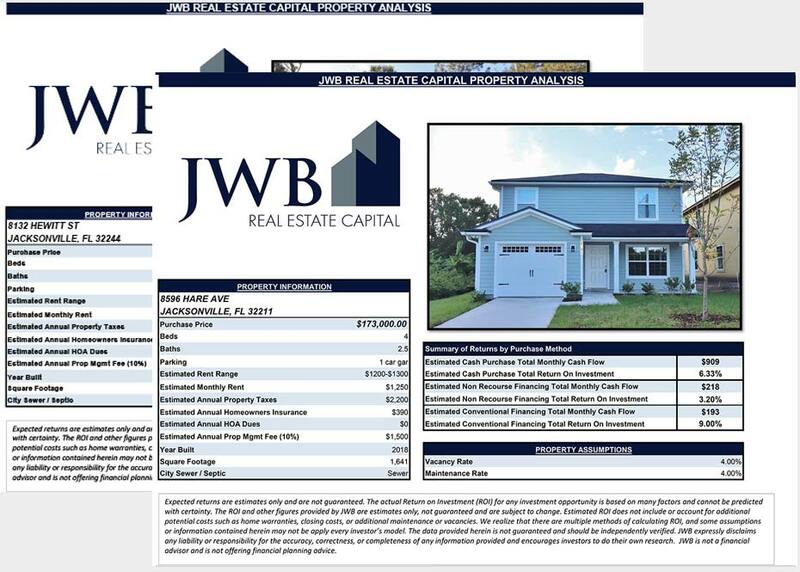 We have a consistent approach that delivers steady cash flow from our clients investment properties. Curious what your cash flow could be from one of our rental properties? 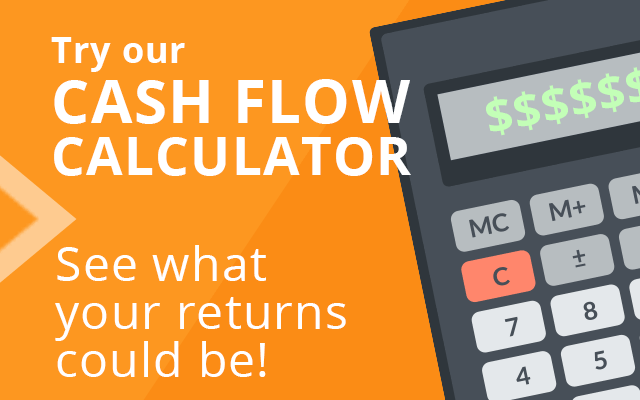 Try our cash flow calculator or contact us to learn more.